The 2015 Ford Edge gains style, speed and interior space along with some impressive levels of technology, but loading it up with features can make it an expensive proposition. The crossover moves to a new platform that also underpins the latest Ford Fusion and gains an all-new suspension, two new engines and a host of safety and convenience features. There are three powertrain options for the Edge, starting with Ford's first standard EcoBoost engine. An updated turbocharged 2.0-liter EcoBoost four-cylinder will be standard, while the carryover 3.5-liter V-6 remains the optional engine. The Edge Sport gets a turbocharged 2.7-liter EcoBoost V-6. All engines will be mated to a six-speed automatic transmission, with front-wheel drive the standard setup. Unlike the previous model years, all-wheel drive will be optional on all engine configurations. Ford says the suspension is all-new for the Edge, with a firmer sport-oriented setup specified for the Edge Sport model. The new 2016 Edge is sleek and looks fast. Cues from the rest of the modern Ford lineup are evident in the grille's shape, the character line running down the body, and the taillights that look like they could've been lifted from the latest Ford Fusion, which is a good thing. The Edge is a much more distinctive, attractive vehicle than the one it replaces, and it retains enough cues from the old model, and a choice of 18", 20" or 21" wheels is available depending on model and trim. Where is Milnes Ford located? How can I order parts for my Edge? Do you have any vehicles on special this month? The 2015 Ford Edge comes standard with antilock brakes, traction and stability control, Ford's Curve Control, front knee airbags, front side airbags, side curtain airbags and a rearview camera. The Ford Sync system includes an emergency crash-notification feature that automatically dials 911 when paired with a compatible cell phone. Also standard is Ford's MyKey, which can be used to set certain parameters for secondary drivers such as teens or valets. All but the SE also have rear parking sensors. 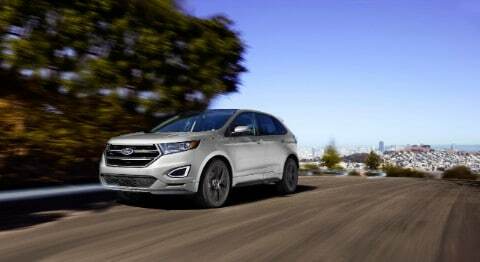 Give us a call today if you would like more information on the 2015 Ford Edge!